Yesterday, Amelia wrapped her fingers around the arch of my right foot and began to gently massage the tiny bones beneath its surface. She tugged and stretched the atrophied ligaments and tendons too. I could feel the bones cracking and every once in awhile we heard a popping sound. They surprised us both, but I told her not to worry, she was not causing me any pain. More and more tension was eased as she worked her way down to my heel. I closed my eyes and laced my fingers behind my head. Shifting in her seat, Amelia began to move my foot outward and down. She told me I had to reeducate the signals of my brain. The signals in my brain have become numb, and I feel like a drone. I’ve numbed my brain and body with food, mundane television and an addiction to Facebook. I’d hoped to write a book while I was off on medical. It didn’t happen. Instead, I wallowed in ice cream and fast food delivery. I’ve gained weight while being sedentary. Food didn’t make feel any better. It didn’t fill my soul. I think in abstract instead of full sentences. Thoughts and ideas start, then stop. They become dead ends and hide somewhere in the synapses of my brain. Romance. Love. Anger. Doubts. Pain in the ankle. Pain in the heart. Thoughts muddled. Scarred soul along with the ankle. Loneliness. Independence. Faith. Fear. Prayers. I worried about being dependent on pain meds so I weaned myself from them as quickly as I could. Tylenol does the job when taken regularly. The bones have healed, and so have the incisions. The original trauma site continues to heal, from the inside out. I ingest supplements for hair, skin and nails in hopes that it will heal more quickly. I’m tired of being reminded of my stupidity, and the fact that my body and car were totaled. That my insurance was canceled. That I have no idea when and if I will be able to walk normally again. Whether or not I will be able to drive again. Or how the hell I’m going to buy a car or insurance anyway. I worry about my weight and the fact that none of my clothes fit. Will my newly knitted bones be able to hold up my fatness. Will I be loved or held again. Will I have a partner in crime and in life. Will I have to fight to find love, while I fight to regain my body again. Or will only creepy old dudes find me attractive. Will I be able to point my toes normally. Will all of this damn work be for naught. Will the Talus bone die. Will the ankle be fused and my recovery start all over again? Where are my high heels? It’s raining right now and all I want to do is run out into it. I want to run away. I want to smell worms and springtime. I want to be myself again. A free spirit, effervescent, sparkly and unafraid of tomorrow. I want to bear weight and walk into the deluge outside my window. To feel it drench my skin and wash my soul clean. I want to live unencumbered by weight, a walker, or a limp. Life is to be lived. Not by sitting on my couch and staring out the door wall, but by participating in it. 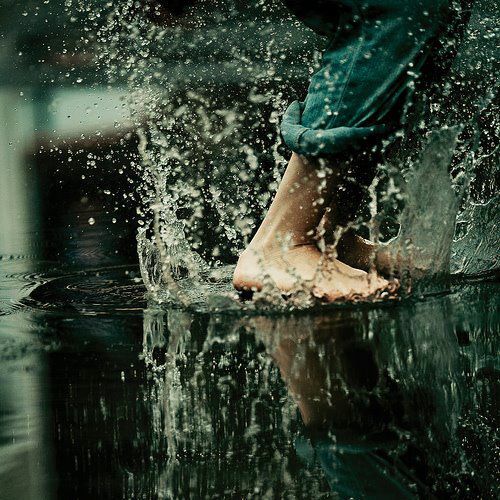 The rainstorm has left puddles that I’d love to splash in. Ah, to feel the rain and grit cover my calves would be heaven.